The Material Transfer Agreement is executed in fulfillment of Article 9 of the Biodiversity Act of Bhutan, 2003 and in concurrence to the Executive Order of the Honorable Secretary, Ministry of Agriculture and Forests, where in, it affirms that the National Biodiversity Centre (NBC) is the office designate for implementing the Material Transfer Agreements (MTA). 1. What is a Material Transfer Agreement? A Material Transfer Agreement is a written contract which defines the rights, obligations and restrictions for both the provider and the recipient with respect to the materials or any derivatives, and any confidential information exchanged with the material. It addresses issues such as ownership of materials and rights over the inventions resulting from the use of the materials, transfer and use of the material and any resulting publications or intellectual property rights. 2. Why do we need a Material Transfer Agreement? Ensure that access results in the fair and equitable sharing of benefits. Avoid unregulated access taking place. Facilitate research collaborations with national capacity-building. Fix accountability on the part of the Provider as well as Recipient of the material. Enable generation of information and knowledge sharing. 3. When do we need to execute a Material Transfer Agreement? A Material Transfer Agreement is executed when Bhutanese biological/genetic resources are transferred to other countries for research and commercialization. It excludes biological resources which are traded as commodity for direct consumption. However, if the materials traded as commodity are later intended to be used for research and commercialization, a Material Transfer Agreement has to be executed. 4. Who are the Provider and the Recipient? Anyone sending the material is a Provider and anyone one receiving the material is a Recipient. 5. How should we process for a Material Transfer Agreement? Intended purpose of material transfer. Types and numbers of material to be transferred. Final destination of the material. Details of the provider and recipient including proper mailing address. National Identity number for a Bhutanese and Passport Number for forei gners. 6. What types of materials are being transferred at present? The types of materials typically transferred under Material Transfer Agreements include biological/genetic resources, such as plants and their extracts, insect vectors, soil and their derivatives, fungi, blood samples etc. Those species listed under Schedule I of the Forest and Nature Conservation Act of Bhutan are totally protected and not permitted for transfer. 7. How long does it take to obtain a Material Transfer Agreement? A minimum of 10 working days is required to process a Material Transfer Agreement for academic research whereas applications on commercial access and research are dealt on a case by case basis. 8. What are the obligations in relation to materials transferred under a Material Transfer Agreement? It is the responsibility of the Recipient to safeguard and protect the transferred materials from misuse and prevent third party transfer without the prior consent and written approval of RGoB. It is also the responsibility of the Recipient to bring to the notice of relevant authorities of their organization about the conditions set in the agreement and usage of the transferred materials. 9. 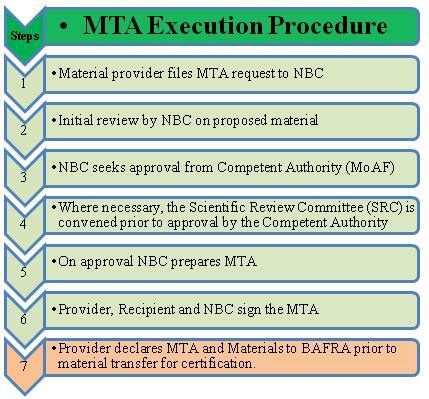 How do we track the progress of the executed Material Transfer Agreements? The Recipient and the Provider shall provide six monthly updates on the progress of the study to the MoAF through NBC. The full study results including confidential information shall be submitted to NBC upon completion of the study. In the event that the Provider and the Recipient fail to report on the progress, NBC shall send timely reminders. 10. Who holds right for the inventions resulting from the use of the transferred materials? As per the terms and conditions of the Material Transfer Agreement, the ownership of the transferred material is vested with the RGoB. In case of new discoveries, the Recipient and the Provider shall inform the MoAF through NBC of such discoveries. The Recipient and the Provider shall not apply for any intellectual property rights without prior written approval from the RGoB.